The day you sit down to write your wedding ceremony script is the day that it hits you: for something that can take as little as ten minutes, your wedding ceremony is a wildly important part of your day. After all, the ceremony is when you get married, and the act of marriage is why you’re all there celebrating. If you’re having a religious wedding, your wedding ceremony script is often provided for you by your religious leader and is sometimes quite a bit longer than ten minutes. (Full Mass with Holy Communion? You’ll be there awhile.) If you’re opting for a secular wedding, you’ll probably find that you’re going to need to come up with a wedding ceremony script on your own. And as it turns out, creating a whole ritual from scratch can be a tad overwhelming. There is a reason that wedding ceremonies have been worked on for generations… it feels like it takes hundreds of years to come up with just the right words. And while you should totally start with our guide to writing a wedding ceremony, but having a real wedding ceremony script to look at will help you put all of those ideas into practice, which is why we’ve picked three of our favorites for you. While you can include or omit most of these elements, depending on personal taste and preference, in most places you do generally, legally, need to include a declaration of intent in their wedding ceremony script. This is what we think of as the “I dos,” or “I do in fact legally want to marry this person, and I’m here by choice.” So as you’re crafting your own wedding ceremony, remember to include that key part. But when you’re creating your wedding ceremony, plagiarism is key. You can’t do it in a term paper, you can’t do it when you’re writing a book, but when you’re crafting your wedding ceremony script, you can steal all the best stuff that everyone else has written. How do you think traditions get started, anyway? Beyond the scripts below, we have a ton of other ceremony-writing resources here on APW: traditional wedding vows from various cultures and religions, non-cheesy wedding poems, an essay examining what it means to invite the sacred into your wedding, and hundreds of comments in which readers share their own vows. But today we wanted to highlight some of our favorite ceremony scripts from the APW archives, plus share a never-before-published script from our staff (and we’ll hopefully get to read many more scripts from you in the comments). So to help you craft your own ceremony, we give you these wedding ceremony samples, to get you started. 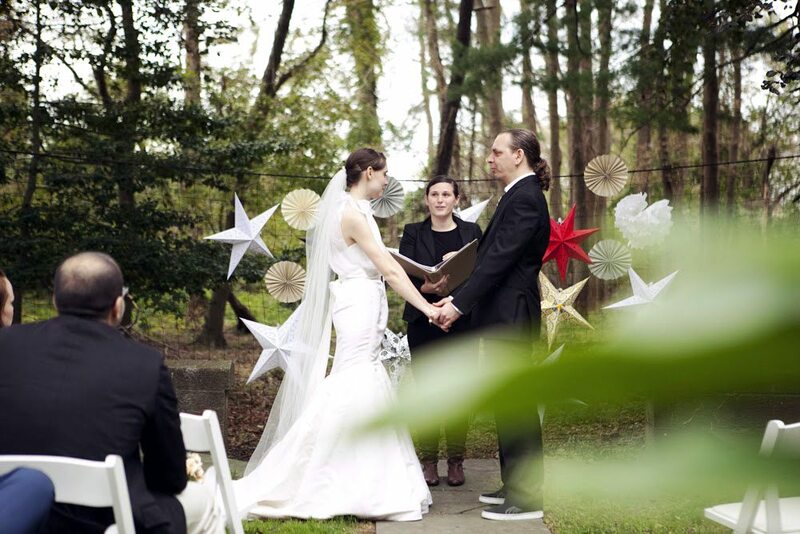 This wedding ceremony comes from APW’s Partnerships Director Keriann. 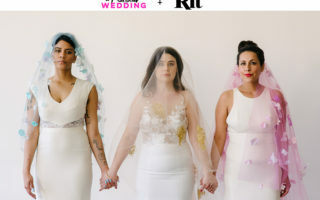 She and her husband wanted a poetic ceremony that encouraged audience participation and… that stayed away from religion. Here is her wedding ceremony script, inspired by the best stuff she found on the internet, natch. Her circa 2011 sources included Peonies and Polaroids, Indie Bride, “Union” by Robert Fulghum, and most of the sources mentioned here. On behalf of Keriann and Scott, I would like to thank you all for being here this afternoon. For taking the time and making the journey, and for all the effort that it takes—not only to be a part of this day, but to be a part of each other’s lives. Keriann and Scott have invited you here to this beautiful place to show you a glimpse of an important piece of their love. To share with you trails, woodlands, marshes, and beaches, like the ones they’ve often explored during their years together. Whenever we attend a wedding, we are given the opportunity to reflect on our own relationships. We might look at the couple before us and be tempted to compare their love to the quality of our own relationships. The truth is that every relationship is as unique as the individuals in it, but one thing holds true: For love to exist between two people, each person must allow the vulnerability of giving his or her love to the other, and each must be open to receiving the other’s love in turn. Therefore each of us is a powerful creator of love. Each of us, every moment of every day, has the choice to dedicate ourselves to one another or to withhold our love and caring. If you ask couples who have a strong and abiding love what they like most about their partners, many will say when they are with that person they don’t have to pretend to be anything other than what they are. They are able to express themselves without fear of being judged or rejected. There is room in the relationship for both of them to be unique individuals. They are free to surrender to the vulnerability of true intimacy—to be known and loved unconditionally. At this time, Keriann and Scott would like to take a moment to honor those loved ones who are not with us today. Please take a moment of silence. In the spirit of love and life, Keriann and Scott have selected two readings to share today. The first is “Ithaca” by Constantine Cavafy. Without her you would have never set out on the road. She has nothing more to give you. And if you find her poor, Ithaca has not deceived you. Wise as you have become, with so much experience, you must already have understood what Ithacas mean. Next, an adapted version of Edward Monkton’s A Lovely Love Story, read by two friends. A: The fierce lobster was trapped by rocks inside a cave. Although it was dark he was happy in there. It was, after all, his cave. Then along came the Lovely Other Lobster. B: The Lovely Other Lobster removed the rocks that blocked the Lobster’s cage with kind words, loving thoughts, and mighty pincers. A: I like this lobster thought the Lovely Other Lobster. Although he is fierce he is also tender and he is funny. He is also quite clever though I will not tell him this for now. B: I like this Lovely Other Lobster, thought the lobster. She is beautiful and she is different and she swims so nicely. She is also a free spirit which is a quality I much admire in a lobster. A: But he can be so distant and so peculiar at times, thought the Lovely Other Lobster. He is also overly fond of things. Are all lobsters so overly fond of things? B: But her mind skips from here to there so quickly thought the lobster. She is also uncommonly keen on shopping. Are all Lovely Other Lobsters so uncommonly keen on shopping? A: I will forgive his peculiarity and his concern for things, thought the Lovely Other Lobster. For they are part of what makes him a richly charactered individual. B: I will forgive her skipping mind and her fondness for shopping, thought the Lobster. For she fills our life with beautiful thoughts and wonderful surprises. Besides, I am not unkeen on shopping either. A: Now the lobster and the Lovely Other Lobster are old. Look at them. Together they swim in the sea telling each other stories and feeling the warmth of the ocean on their pincers. Keriann and Scott would like to invite you to participate in their wedding celebration through the ritual of the Friendship circle. Anyone who wishes to may now stand and share their thoughts and feelings. Messages may be literal or metaphorical, and about anything appropriate to the occasion—love, family, marriage, life. You may want to offer your blessing, or to share a story about them individually or as a couple. Anyone may stand and speak if so moved—if you would like to speak, please stand as the last person finishes. Throughout time countless millions of people from many cultures, religions, and societies have gathered among friends and families to celebrate their love for one and other and their commitment to each other. Each culture has symbols and rituals to celebrate marriage, from the Chinese tea ceremony to the Jewish tradition of breaking the glass, a rich tapestry of traditions from around the world combine to symbolize the meaning of marriage. Today we should try to remember that a wedding is a symbol, a heartfelt and meaningful symbol but a symbol nonetheless. This ceremony is not magic, it will not create a relationship that does not already exist and has not already been celebrated in all the commitments Scott and Keriann have made to each other, both large and small, in the days since they first met. What we are celebrating today is not the beginning of a marriage, but a marriage-already-in- progress. This ceremony is a symbol of how far they have come together and a symbol of the promises that they will continue to make to each other throughout live their lives together. Before this moment you have been many things to one another—co-worker, friend, fiancé(e), But now you shall say a few words that take you across a threshold of life, and things will never quite be the same between you. For after these vows, you shall say to the world, this—is my husband; this—is my wife. Nothing is easier than standing here and saying these words, and nothing is more difficult than living them day to day. When you love someone, you do not love them all the time in exactly the same way. That is impossible. Yet that is what most of us expect. We forget the ebb and flow of life and of love and of relationships. We insist on permanence, on duration, on continuity. But in love, as in life, the only stability is in change, in growth, and in freedom. Therefore what you promise today must be renewed and reaffirmed tomorrow and all the tomorrows to come. Having considered all of these things, Scott, do you promise to do your very best each day to create a loving, healthy, and happy marriage? Keriann, do you promise to do your very best each day to create a loving, healthy, and happy marriage? Now, please declare your wedding vows to each other. Please take hands. And all of you who love each other, please take each other’s hands as well. To reach out to someone and be acknowledged and loved is a human need. Taking the hand of one who loves you is a powerful symbol of that unspoken bond. Please take a good look at your partner’s hands, so you may see the gift that they are to you. These are the hands of your best friend, that are holding yours on your wedding day. These are the hands that will work alongside yours, as together you build your future. These are the hands that when wrinkled and aged will still be reaching for yours. This is the point in the ceremony when people usually talk about the wedding bands being a perfect circle, having no beginning and no end. But we all know that these rings have a beginning. Rock is dug up from the earth. Metals are liquefied in a furnace at a thousand degrees. The hot metal is forged, cooled, and then painstakingly polished. Something beautiful is made from raw elements. Love is like that. It comes from humble beginnings, made by imperfect beings. It is the process of making something beautiful where there was once nothing at all. No one but you can declare yourselves married. You have begun it here today in speaking your vows before your family and friends, and you will do it again in the days and years to come, standing by each other, sharing the highs and lows of life. and to love and be loved by the friends and family who have come here today to support you. May you make a home together that is at once sheltering and welcoming. May you each do meaningful, productive work at home and in the world, learning from your failures and growing in your accomplishments. May life’s challenges be met together with courage and optimism, and may your days be filled with laughter, imagination, trust, friendship, and love. May the wind be always at your back. May the sun shine warm upon your face, The rains fall soft upon your fields. It is now my honor and delight to declare you husband and wife—you may seal your vows with a kiss! 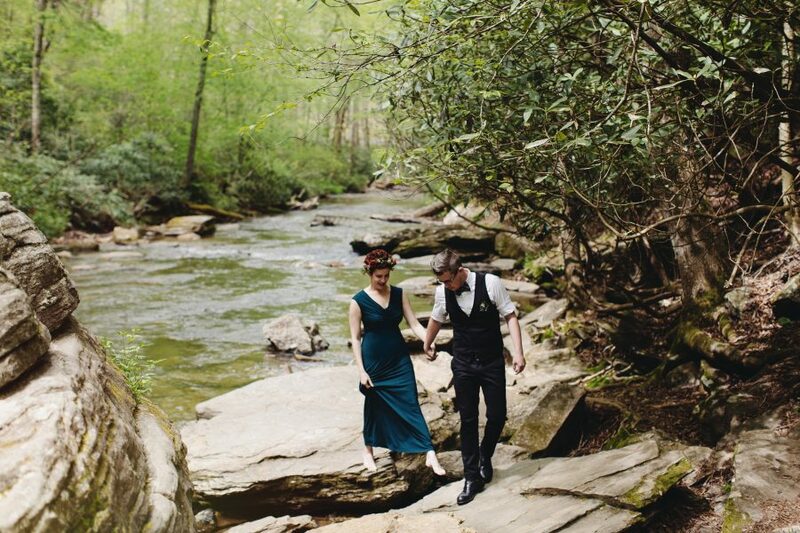 Liz and Micah eloped while barefoot in the woods, and their wedding ceremony script was the stuff of giddy dreams. If you’re looking for wedding ceremony inspiration (and you’re making the whole thing up from scratch), this is a great place to start. I’m thrilled and honored to be here with my little family to witness, celebrate, and usher in the beginning of yours. It got me thinking about marriage… and what that looks like. In particular, what that will look like for the two of you. The most perfect pasta, creamy custard, and buttermilk biscuits. From scratch. With love. Dreamings over a shared pint of Fullsteam First Frost. Late night reminiscing and record spinning. Backyard grilling, planting, and harvesting. Making a home together… twelve thousand miles from where you started. May your marriage be a never-ending edit of beautiful vignettes—captured and shared alongside, and with, each other. For as long as you both shall live. not a tavern, but a temple. I said “as you wish” from the beginning… I loved you from the start. You have known each other from the first glance of acquaintance to this point of commitment. At some point, you decided to marry. From that moment of yes, to this moment of yes, indeed, you have been making commitments in an informal way. All of those conversations that were held in a car, or over a meal, or during long walks—all those conversations that began with, “When we’re married,” and continued with “I will” and “you will” and “we will”—all those late-night talks that included “someday” and “somehow” and “maybe”—and all those promises that are unspoken matters of the heart. All these common things, and more, are the real process of a wedding. Look at one another and remember this moment in time. Before this moment you have been many things to one another—acquaintance, friend, companion, lover, dancing partner, even teacher, for you have learned much from one another these past few years. Shortly you shall say a few words that will take you across a threshold of life, and things between you will never quite be the same. Liz, pick up Micah’s ring, and repeat after me. L: Micah, I want to spend the rest of my life with you. I vow to love and serve you as long as we both shall live. I take you with all your faults and strengths as I offer myself to you—with all my faults and strengths. I vow to help you when you need help, and turn to you when I need help. And with this ring, I take you to be my lawfully wedded husband, my constant friend, my partner in crime, and my love from this day forward. Micah, pick up Liz’s ring, and repeat after me. M: Liz, I want to spend the rest of my life with you. And with this ring, I take you to be my lawfully wedded wife, my constant friend, my partner in crime, and my love from this day forward. Now that you have given yourselves to each other with solemn vows, and the giving and receiving of rings, in front of God and all who are assembled here—it is with great joy that I pronounce you husband and wife. And finally, you may begin your marriage how you began your relationship: with a strong drink on a weekday. Cheers! Handfasting is an old Pagan custom that dates back to the time of the ancient Celts. 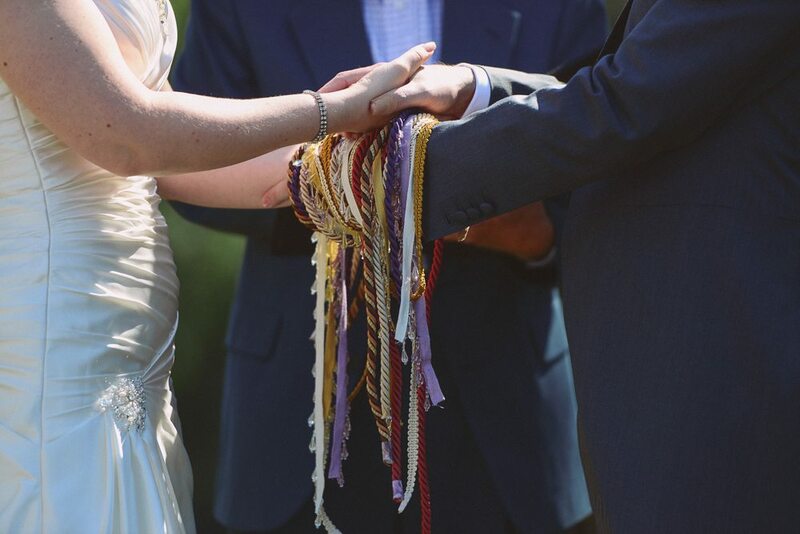 It originated as more than an act during a wedding ceremony—in fact, the entire handfasting took place over a period of around a year and served as a trial marriage. This wedding ceremony script incorporates passages from various authors’ works, including Gift from the Sea by Anne Morrow Lindbergh. You can also find sample vows for a six-corded and four-corded ceremony here. Blake and Jessie, today you are surrounded by your family and friends, all of whom are gathered to witness your exchange of vows and to share in the joy of this occasion. Let this be a statement of what you mean to each other and the commitment of marriage you will make. When you love someone, you do not love them all the time in exactly the same way, from moment to moment. It is an impossibility. It is even a lie to pretend to. And yet this is exactly what most of us demand. We have so little faith in the ebb and flow of life, of love and of relationships. We leap at the flow of the tide and resist in the terror of the ebb. We are afraid it will never return. We insist on permanency, on duration, on continuity, when the only continuity possible, in life as in love, is in growth, in fluidity, in freedom. Relationships must be like islands, one must accept them for what they are here and now, within their limits—islands, surrounded and interrupted by the sea, and continually visited and abandoned by the tides of life. Blake and Jessie have chosen to incorporate the ancient Celtic ritual of handfasting in their wedding ceremony today. Handfasting is a declaration of intent where the couple clearly states that they are marrying of their own free will. Jessie and Blake, know now before you go further that since your lives have crossed in this life, you have formed eternal bonds. As you seek to enter this state of matrimony, you should strive to make real ideals that give meaning to this ceremony and to the sanctity of marriage. With full awareness, know that within this circle you are declaring your intent before your friends and family as witnesses. The promises made today and the ties that are bound here greatly strengthen your union and will cross the years and lives of each soul’s growth. Do you seek to enter this ceremony? Blake and Jessie, please look into each other’s eyes. Jessie, will you share in Blake’s pain and seek to alleviate it? Blake, will you share in Jessie’s pain and seek to alleviate it? Jessie, will you share in Blake’s laughter and look for the brightness and the positive in her? Blake, will you share in Jessie’s laughter and look for the brightness and positive in him? Jessie, will you share in Blake’s burdens so that your spirits may grow in this union? Blake, will you share in Jessie’s burdens so that your spirits may grow in this union? Jessie, will you share in Blake’s dreams? Blake, will you share in Jessie’s dreams? Jessie, will you take the heat of anger and use it to temper the strength of this union? Blake, will you take the heat of anger and use it to temper the strength of this union? Jessie, will you honor Blake as an equal in this union? Blake, will you honor Jessie as an equal in this union? Blake and Jessie, as your hands are bound together now, so your lives and spirits are joined in a union of love and trust. The bond of marriage is not formed by these cords, but rather by the vows you have made. For always you hold in your own hands the fate of this union. Above you are stars and below you is earth. Like stars, your love should be a constant source of light, and like the earth, a firm foundation from which to grow. I will now ask you to seal the vows you share with each other by the giving and receiving of rings. The perfect circle of the ring symbolizes eternity. The precious metal came from the ground as a rough ore and was heated and purified, shaped and polished. Something beautiful was made from raw elements. Love is like that. It comes from humble beginnings, made by imperfect beings. It is the process of making something beautiful where there was once nothing at all. Blake and Jessie, on behalf of all those present, and by the strength of your own love, I pronounce you married. Who is up for sharing their wedding ceremony script? What did you love? What would you change if you were writing it again today?